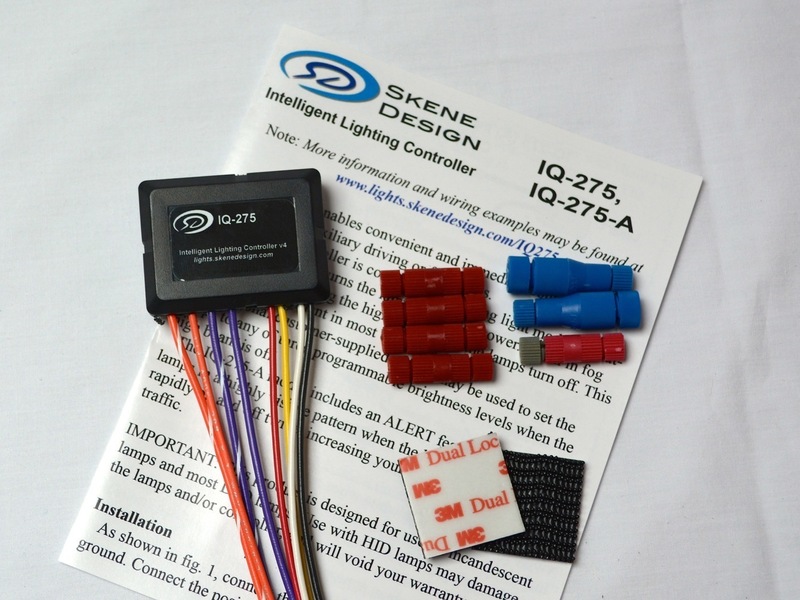 The IQ-275 Intelligent Lighting Controller from Skene Design allows you to quickly and conveniently set the brightness of your auxiliary LED or incandescent lights to match riding conditions. Often auxiliary lights are too bright or have too wide a beam pattern to operate at full power during the day or under certain road conditions. With Skene Design’s innovative intelligent lighting controller you can pre-program several different brightness settings and with the flick of a switch immediately select the desired brightness. There’s no fumbling with a knob or a wireless remote trying to guess the best level. The IQ-275 has been designed by a motorcyclist for motorcyclists. It allows you to quickly and safely select just the right brightness level for you auxiliary lights without having to look at a knob to turn or read a screen: you simply flick a 2 or 3 position switch or double tap a button. It has two possible modes of operation depending upon the type of lights you have, driving or fog lights. In Driving Light mode, when your motorcycle’s high beam is off the controller will set the auxiliary lights to one of several user-programmed brightness settings depending upon the position of a brightness switch. When the motorcycle’s high beam is activated, the controller overrides the switch setting and sends full power to the lamps. In Fog Light mode, the same brightness selection is used but when the high beam is activated the auxiliary lights are turned off. Multiple brightness settings are available with the use of an optional, customer-provided switch. If a two-position toggle switch is used, two brightness settings may be selected in addition to the high beam override. If a three-position center-off toggle switch is used, three brightness settings may be selected. Each of these settings is adjustable from off to full brightness in 10% steps, providing very flexible and convenient control over the lamps’ brightness. You can even use a momentary-contact pushbutton switch to toggle back and forth between two brightness levels. (The turn signal cancel switch on the right handlebar on BMW’s can be used for this purpose.) If no switch is used, the lamps will come on at a single, programmable brightness level when the high beam is off. See the wiring diagram below for details. The positive connection from the controller can be connected through a fuse directly to the vehicle’s battery. No separate relay is required, as the controller performs this function. This simplifies wiring, eliminates extra components, and improves reliability compared to the traditional relay wiring harness.